File photo of Army Bomb Disposal team equipment. 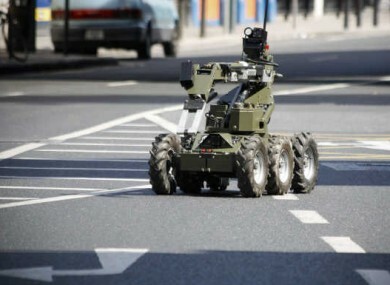 AN ARMY BOMB disposal team made a quantity of unsafe acid safe at a laboratory in Celbridge, Co Kildare this evening. The Defence Forces team was called to the Central Veterinary Research Laboratory, where the acid was found during a routine audit of chemicals on site. The acid is a chemical reagent which can crystallise and become unstable over time. The chemicals were removed to waste ground nearby, where they were subjected to a controlled explosion. The scene was declared safe at 5.50pm. The team recently carried out a controlled explosion on a quantity of unstable Picric Acid discovered at the Pharmaceutical Society of Ireland in Dublin. So far this year, the bomb disposal team been called out 16 times to deal with unstable chemicals. Today was their 165th call out so far this year overall. Email “Controlled explosion carried out on chemicals in Celbridge”. Feedback on “Controlled explosion carried out on chemicals in Celbridge”.